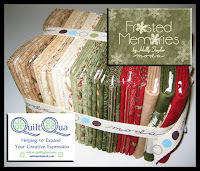 Quilt Qua is having a "Tell a Friend" Giveaway. Click the link to put in your name. These are the lovely fabrics in the prize! I'm hitting into my UFO pile with great determination. Lord willing, this is the summer to catch up!